Reverting to one of Mubarak’s favorite tactics, the Supreme Council of the Armed Forces (SCAF) is trying to delegitimize the demands of street protesters by claiming that the crowd in Tahrir Square is an unruly collection of hooligans, radical soccer fans and religious zealots who do not represent Egyptian public opinion. On November 21, SCAF member General Mohsen al-Fangary tried to argue that the thousands of protesters in Tahrir Square don’t speak for all Egyptians. However, a timely new poll jointly produced jointly by Brookings and Zogby International suggests that anti-military sentiment in Egypt is far more widespread than the SCAF would like to believe. A plurality of Egyptians, 43 percent, believe that the military rulers are working to slow or reverse the gains of the revolution. Only 21 percent of Egyptians believe that the military is working to advance the revolution’s gains, and 14 percent believe that the military authorities are indifferent. Anti-military sentiment has clearly reached its high-water mark since this survey data was collected, and the SCAF can no longer credibly dismiss its critics in Tahrir Square as an unrepresentative sample. “I want the country to be cleansed” said activist Ahmad Harara, a young dentist in his thirties who lost his right eye in the beginning of the Egyptian Revolution on January 28 and lost his left eye last Saturday, November 19, when he was shot by police snipers. Rooftop snipers have not been seen since last January, but this week they returned, more brutal than ever and backed by military units, to confront the second wave of the revolution. As protesters call for a second uprising, Ahmad and his friends in Tahrir Square are telling the Supreme Council of the Armed Forces (SCAF), “Enough is enough,” after months of mismanaging the transition and thwarting the revolution’s demands. The SCAF’s recent behavior has convinced protesters that the military is simply reproducing the regime that they supposedly toppled last January. The confrontations began on November 19 following a major demonstration against the military on Friday, November 18. Islamic movements led the demonstration to protest the constitutional principles document prepared by Deputy Prime Minister Ali al-Selmi, which outlined sweeping powers for the military, and to demand a quick transfer of power to civilian leadership. While most political movements left the square on the evening of November 19, around 200 injured protesters and their families remained, determined to continue their sit-in overnight. The police’s use of excessive force to break down their demonstration was “the straw that broke the camel's back.” It led to the “explosion” of confrontations that are ongoing, in a manner that is reminiscent of the early days of the revolution. I participated in the deliberations that took place around the Tahrir Square’s main stage the night Mubarak stepped down (February 11, 2011). As the former president transferred executive authority to the SCAF, protesters were divided into two camps on the question of how to respond to the power transfer. Some called for continued demonstrations until the SCAF had fulfilled the demands of the revolution, while others felt that the SCAF should be given a chance to meet their demands and called on protesters to end their sit-in. Ultimately, the second camp prevailed. However, protesters have since come to the conclusion that leaving the Square before the revolution’s demands were met was a historic mistake. The military will not easily give up the power it has held since 1952, and it now seems that the entrenched interests of the SCAF are in danger of extinguishing the revolution’s dreams. According to Amnesty International, some of the human rights violations perpetrated by the current government are worse than those committed by the former regime. Will the elections, scheduled for November 28, be held on time? How dangerous is it to hold elections under the current circumstances with many parties announcing their withdrawal from the electoral race? How legitimate will the elected parliament be? How much more will the clashes escalate? With the bloody confrontations entering their fifth day, the increase in the number of victims and injured (around 33 dead and 2000 injured by November 21) and the spread of protests to over ten governorates, it seems that Egypt’s political crisis has reached the point of no return and the window of opportunity for reaching a political resolution that would allow elections to start on time is rapidly closing. For the protesters in Tahrir Square, the SCAF has fundamentally lost its legitimacy. In light of all the crimes it has committed, it is clearly time for the military to give up power and form a national salvation cabinet tasked with administering the remainder of the transitional period. However, it appears that leading political forces, including the Muslim Brotherhood, are no longer representing the interests of protesters after they met with Field Marshal Tantawi on November 22 and agreed to his “solution” and timeline for a transfer of power by June 2012. But it is clear that these political leaders do not speak for the protesters in Tahrir Square and do not have the ability to control or disperse them. While the current clashes represent a dramatic escalation of the military’s repressive tactics, it should be noted that the army has been using excessive force to suppress peaceful protests for months, most recently in the Maspero incident on October 9, which resulted in 27 casualties, mostly Coptic Christians. Whereas the SCAF has been careful to avoid crossing the line of excessive violence in previous confrontations, the military is showing no such restraint in the current clashes. Some have attributed the crackdown to the SCAF’s desire to cancel elections, but is this motivation really powerful enough to prompt a Syrian-style bloodbath? If the SCAF continues to use excessive force in the face of demands for its overthrow and prosecution, Egypt will likely follow the Syrian example rather than the Tunisian one. 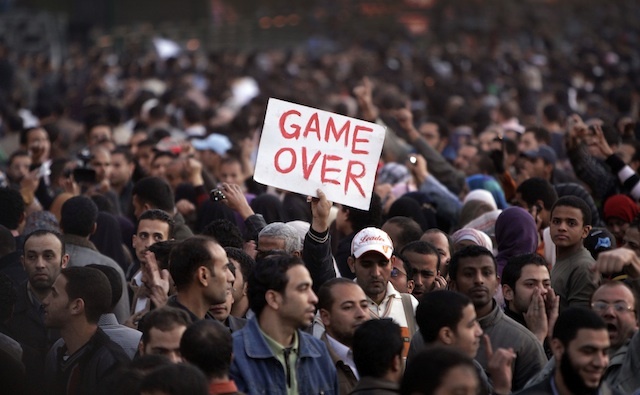 In the first round of the revolution, protesters’ forced the regime to meet their core demand: Mubarak’s removal. Will they succeed this time or will the revolution devolve into a Syria-style meltdown, as the military deploys lethal violence in a desperate attempt to retain control? Magdy Samaan is a freelance journalist and a 2011 MENA Democracy Fellow at the World Affairs Institute. Tens of thousands of protesters remain in Tahrir Square as the demonstration enters its fourth day, with the official death toll climbing to 28. Most major political forces are calling for the formation of a “national salvation government” and Field Marshal Tantawi reportedly met with several candidates for the premiership in an emergency meeting. Meanwhile, the Egyptian pound fell to its lowest level since 2005. Egyptian political parties are trying to translate the anti-SCAF anger of protestors in Cairo and elsewhere into a set of specific demands. While each major party has a slightly different version, the two key demands are holding a presidential election by April 2012 and forming a “national salvation government” to run the country until that time. Clashes between security forces and protesters in Tahrir Square escalated dramatically on November 19 and 20, resulting in at least 35 casualties and 1,700 injuries, as riot police used tear gas, rubber bullets as well as live ammunition and attacked field hospitals in an effort to disperse the crowd. As several prominent parliamentary candidates and political groups suspended their campaigns in protest of the government crackdown, the SCAF insisted that elections will not be postponed. Would a new Trade Union Law resolve labor protests? Social protests and labor strikes have escalated to unprecedented levels in Egypt since the January 25 uprising. In recent months, workers have staged hundreds of protests spanning almost all industrial and service sectors in Egypt. Although labor activism has been on the rise since the revolution, the surge in labor protests actually started before the revolution, with approximately 266 protests in 2006, 614 in 2007, 630 in 2008 and 609 in 2009. This explosion of labor activism was a natural result of the economic policies established during Ahmed Nazif’s government beginning in 2004, which promoted growth at the expense of social justice, and led to growing economic inequality. Why have thousands of workers chosen to express themselves through protests movements outside of any institutional framework and what can be done to address their demands? The answer, I will argue, lies in implementing a draft law on trade unions that the Ministry of Manpower has been working on for several months. Identifying the cause of the rise in labor protests over the past decade is very simple: Workers felt that the institution that was supposedly representing their interests under Mubarak’s rule, the state-run Egyptian Trade Union Federation (ETUF), was actually defending the interests of the regime. In a partial concession to the labor movement, the interim government has agreed to dissolve ETUF’s board, but the institution continues to function. In an effort to circumvent state regulation of the labor movement, union leaders announced the establishment of Egypt’s first independent federation of trade unions in March 2011. Increasingly, workers are looking to their own trusted leaders to negotiate on their behalf. As labor unions become increasingly independent and assertive, it will become necessary to institutionalize the negotiation process between workers on the one hand and government or private sector businessmen on the other, if Egypt is to achieve a successful democratic transition. In other words, we need to formulate a new social contract acceptable to both workers and the state, something that requires the presence of institutions that are truly representative of the labor movement. It is worth looking to the examples of Spain and Portugal, which during their own democratic transitions witnessed hundreds of social protests similar to those Egypt is seeing today. Unlike Portugal, where sustained demonstrations had a destabilizing effect on the transition, Spain’s government was able to maintain its legitimacy by negotiating with politicians, parties and trade unions a plan for managing the economy throughout the transition. By accommodating workers demands’ with the consensus agreement known as the “Moncloa Pact,” Spain’s leaders kept the democratic transition on track. Is there an equivalent of the Moncloa Pact that would help resolve Egypt’s labor crisis? Allowing trade union pluralism by replacing the 1976 Trade Union Law No. 35, which required unions to join the umbrella state-regulated labor federation, ETUF. Guaranteeing the right of workers to form trade unions without undue administrative or bureaucratic obstacles, by denying the Ministry of Manpower the right to reject applications for establishing new unions (as was commonplace under Mubarak’s rule). Protecting the right of workers to form their own unions without being subjected to intimidation or pressure from their employers. This reform is essential to shield workers from retaliation, particularly in the private sector, where labor leaders who try to form unions have historically faced harassment or other punishment. Allowing workers to withdraw from national trade federations without forfeiting the savings-and-fellowship funds to which ETUF members are entitled. Under Mubarak’s rule, the ETUF administration tried to regulate and contain the labor movement by witholding the financial benefits from members who left the federation to try to form independent unions. Guaranteeing autonomy for trade unions from administrative and financial oversight by employers and the government, a major feature of the Mubarak-era regulatory framework, in which the Ministryof Manpowerhad sweeping powers to intervene in the affairs of labor unions. Issuing a new trade union law is an urgent and necessary step toward achieving a representative democracy and social justice. After decades of government oversight and intervention in the labor movement, Egyptian workers need a legal framework to support the development of unions that are truly independent and responsive to the interests of their members. Egypt desperately needs a new social contract to protect both the political rights of citizens and the economic rights of workers. Any further delay in implementing the draft law on trade unions could hinder the establishment of this new social contract, increasing the strain on Egypt’s already fragile economy and jeopardizing the success of the transition process as a whole. Nadine Abdalla is a Research Fellow at the Arab Forum for Alternative Studies (AFA) in Cairo and columnist for the independent daily newspaper Al-Masry al-Youm. Her research interests include trade unions and labor movements in the post-Mubarak era. Egyptian parliamentary elections scheduled to start on November 28 are now facing the threat of cancellation or postponement due to renewed protests and violence in Tahrir Square since last Friday, November 18. According to the latest statistics, at least 676 injuries have been recorded in clashes between military police and the protesters who insisted on continuing their sit-in overnight, in defiance of Prime Minister Essam Sharaf’s statement urging protesters to leave Tahrir Square on Friday evening. With clashes continuing for a second day on November 20, central security forces used tear gas and live bullets to control the crowd but failed to disperse the demonstration as thousands more protesters, outraged by the violent crackdown, poured into Tahrir Square to demand an end to military rule. Despite a statement by the ruling Supreme Council of the Armed Forces (SCAF) on November 20 insisting that elections will proceed on schedule, there are signs that major political forces are considering a boycott. In response to the clashes, the Revolution Continues Alliance, the liberal independent Amr Hamzawy, and Kefaya founder George Ishak have all put their campaigns on hold, to protest the use of violence against peaceful protesters, although they did not specify whether they plan to boycott elections. Although Friday’s protest was largely orchestrated by Islamist groups, liberals and leftists quickly answered the call for a massive rally in Tahrir Square. Over the course of the day, these ideologically diverse groups showed unprecedented unity and cooperation in the hope of regaining the lost momentum of the revolution and resisting the SCAF’s political agenda. Given the level of anger and frustration with the military leadership, protesters were stunned and disappointed when Hazem Salah Abu Ismail, a potential presidential candidate and prominent Salafi intellectual, ordered his supporters to leave the square on Friday evening, after they had traveled long distances in trucks and buses to join the protest that morning. The Friday protest was intended to assert major popular demands including but not limited to pressuring the SCAF to transfer power to a civilian regime and protesting the supra-constitutional principles proposed by Deputy Prime Minister Ali al-Selmi. However, Ismail’s surprising statement urging protesters to go home suggests that Islamist groups, especially Salafis, had another undeclared agenda behind the mass demonstration. Apparently, they wanted to use the rally as a political opportunity to flex their muscles and do some free advertising for their parliamentary and presidential candidates. Islamist songs and recitations were loudly heard all over Tahrir Square. On the main stage, Hazem Abu Ismail gave speeches to his supporters that barely touched on the troubled state of Egypt’s political transition or al-Selmi’s controversial draft principles. From time to time, Abu Ismael’s followers responded by chanting, “Allahu Akbar” (“God is great”) and a man on stage shouted, “May Allah give His Support to Hazem.” Many analysts described the scene as “Kandahar Friday,” which I agree accurately sums up the Islamist tone of the rally. Islamists – led by Salafis and the Muslim Brotherhood – are now mobilizing strong constituencies all over the country that are ready to support them in parliamentary elections. The leaders of these movements, however, are abusing Egyptians’ religious piety to score political points, while liberals and leftists who sacrificed their lives in Tahrir Square in January to bring down a dictator are mostly distracted and disorganized. In my next post, I will speak more about the parliamentary elections from an insider’s point of view, as a liberal revolutionary and human rights activist who is now running for parliament in Cairo. Dalia Ziada is competing in the November 2011 parliamentary elections as a candidate for the Eladl Party, a new party founded by young revolutionaries to affirm a moderate Egyptian religious and political ideology. Pressure on Egypt’s military leadership to relinquish power escalated exponentially on November 18, as tens of thousands of protesters returned to Tahrir Square for the largest demonstration since July. Protesters, a majority of whom appeared to be affiliated with the Muslim Brotherhood, Salafis and other Islamist groups, are demanding that the government retract proposed supra-constitutional principles that have been broadly condemned as an at attempt by the military to dictate the drafting of Egypt’s next constitution and construct a legal firewall around its political and economic privileges, including provisions to shield the military’s vast budget – estimated to be around US $4.5 billion – from parliamentary oversight. In an effort to prevent the military from hotwiring the constitution with provisions that could prolong and further institutionalize a system of military rule, an array of liberal and Islamist political forces called for a massive demonstration in Tahrir Square on November 18, and the Brotherhood went so far as to threaten a “second revolution” on January 25 if the draft document is ratified. As the crowd in Tahrir Square swelled over the course of the day, the military initially took a hands-off approach, surveying the scene with helicopters rather than unleashing its usual bag of tricks: tear gas, riot shields and rubber bullets. However, after protesters refused to vacate the square and continued to rally for a second day straight, security forces resorted to violence, sparking fierce clashes that had resulted in at least 676 injuries by November 20. Friday's demonstration and the ensuing violence has backed the SCAF into a corner and exposed its glaring illegitimacy. By the end of the day on November 18, there were reports – later denied – that Prime Minister Essam Sharaf had agreed to defer issuing the constitutional principles until after parliamentary elections and the SCAF announced that the guidelines would no longer be binding, but merely advisory. Although it now appears that the Cabinet will resume discussion of the draft document as early as this week, promising to engage political forces in an inclusive dialogue on the substance of the text, the interim government has clearly been put on the defensive by the latest mass demonstration and will face an uphill battle in reaching any sort of consensus on a document that has been so thoroughly repudiated as a recipe for military dictatorship. Aside from further discrediting the constitutional principles, the demonstration had a secondary and equally significant result: reconciliation among rival Islamist forces that have becoming increasingly divided in recent weeks by fierce competition on the campaign trail. In a surprising turn of events, the Tahrir protest appeared to signal renewed unity among these diverse Islamist forces, which failed to coalesce into a unified electoral alliance at the start of the campaign season, when heated negotiations over the allocation of parliamentary seats led to a major fallout between the Brotherhood’s Freedom and Justice Party (FJP) and the next most organized Islamist force, the Salafi al-Nour Party. Over the summer, the FJP had succeeded in co-opting a number of other Islamist groups into the Democratic Alliance, but when it came time to draw up a joint list of candidates in October, it became clear that the FJP would claim the lion’s share of seats for its own candidates, occupying 90 percent of the alliance’s slots for individual candidacy races and 70 percent of the part-list slots. Accusing the FJP of dominating the joint lists and marginalizing other alliance members, al-Nour and other Islamist parties swiftly defected from the Alliance and tried to regroup in a new Islamist coalition. Led by al-Nour, the Salafi Asala Party, and al-Gama’a al-Islamiyya’s Building and Development Party, the nascent Islamic Alliance tried unsuccessfully to rope in a variety of other Islamist forces – the Salafi Fadila and Amal parties, al-Tawheed al-Arabi, the centrist Wasat Party and a Brotherhood splinter party, al-Riyada – but negotiations broke down before the deadline for registering parliamentary candidates. Over the course of the campaign period, Islamist parties have been acting more like rivals than allies. In late October, Essam al-Arian, vice president of the FJP, bluntly ruled out cooperation with Salafi parties, dismissing them as inexperienced. “It is better and wise … to work individually. [The Salafis] are newcomers to political life and they will be a burden for any coalition,” he said. Although Islamists parties collectively could claim up to thirty percent of the People’s Assembly seats, by some estimates, their failure to cooperate is likely to split the Islamist vote, weakening their overall parliamentary representation relative to liberal and leftist parties. Until now, dueling Islamist parties have been too preoccupied with their own differences to mobilize against the ruling Supreme Council of the Armed Forces (SCAF) as a unified front, but the proposed supra-constitutional principles designed to legally codify the military’s political and economic privileges seem to have reminded the Islamists that they share a common opponent. The major Islamist parties, which expect to be well-represented in the next People’s Assembly, have universally rejected the draft principles, which would encroach on the parliament’s authority to select a 100-member assembly responsible for drafting the next constitution and would therefore undermine the ability of Islamists to enshrine religious values in the new legal framework. United by their shared frustration with the military leadership, Islamist protesters in Tahrir Square on November 18 displayed unity and solidarity for the first time in months. Ironically, in an attempt to consolidate its power with the draft principles, the SCAF has actually weakened its position by galvanizing its Islamist opponents around the common goal of ending military rule. Rallying side by side in the packed square and chanting anti-military slogans in unison, Brotherhood members and Salafis appeared to put their ideological differences aside, at least for the time being. The Salafi preacher Hafez Salama gave a speech from a stage set up by the Muslim Brotherhood in which he called for unity among the Islamist parties and urged them to back a single candidate in each district, to avoid splitting the Islamist vote. The al-Nour Party, which only a few weeks ago was trading accusations of campaign fraud with the Freedom and Justice Party, distributed flyers urging all Islamists to unite behind a shared vision for an Islamic Egypt and calling for a conference at a major mosque to promote cooperation between Islamist groups. With election day fast approaching, will this new display of unity inspire last-minute coordination between Islamist candidates? Whether or not Egypt’s powerful but diverse Islamist forces can find common ground could have significant implications for their representation in the next parliament. Photo Credit: Christian Science Monitor. Ten months after the January uprising, Egypt’s political scene is more diverse and competitive than ever before, as dozens of new parties ranging in ideology from Salafi to secular seek a place in the post-Mubarak political order. However, only a handful of the more than fifty-registered parties are organized enough to stand a chance at winning parliamentary representation on their own. Acknowledging that strength lies in numbers, most of the smaller parties have aligned themselves with one of four major electoral coalitions, which differ significantly in their constituencies and ideological orientation. So far, the primary beneficiaries of the coalition-building process appear to be the Islamist movements, which are confidently predicting a strong showing in the parliamentary elections. Meanwhile, liberal and civil parties – weakened by divisions and rivalries – have struggled to build a cohesive alliance with a clear campaign platform. Taking advantage of these divisions, the Supreme Council of the Armed Forces (SCAF) has moved swiftly in the weeks leading up to elections to consolidate its power and privileges by issuing a set of constitutional principles that would preserve a strong political role for the military and shield its budget from oversight by the next elected parliament. Whether or not the four major electoral coalitions will be able to overcome their fragmentation and work together in the next elected government to hold the SCAF accountable remains to be seen. The Democratic Alliance for Egypt includes many small parties and is led by the Freedom and Justice Party, the official political arm of the Muslim Brotherhood. The Islamic Alliance includes the Salafi al-Nour (Light) and Asala (Authenticity) parties along with official political arm of the formerly militant Islamist group, al-Gama’a al-Islamiyya, the Building and Development party. The Egyptian Bloc Alliance includes the liberal Social Democratic Party, the Free Egyptians Party (founded by the prominent Coptic businessman Naguib Sawiris), and the leftist Tagammu Party. The Revolution Continues Alliance includes seven primarily leftist parties, the Revolutionary Youth Coalition, and the liberal Egypt Freedom party. The electoral coalitions reflect the polarization between Islamist and what so called “Civilian powers” as well as between new political powers after the revolution and what so called “Flol” or (the ex regime remnants) and under the unstable security situation, and the political tension, there is a potential that the election will witness violence increase the state of polarization. The Democratic Alliance for Egypt, initially launched by the Freedom and Justice and Wafd parties, at one pointed included 43 parties. However, the FJP’s dominant position within the Alliance and alleged efforts to manipulate its electoral lists prompted the Wafd and several other liberal parties to defect from the coalition. The FJP was keen to keep the Democratic Alliance, to avoid a state of polarization. Before it began to fragment under the strain of internal rivalries, the Alliance succeeded in reaching a consensus on key principles to be included in the next constitution, including citizenship rights and the preservation of Article 2 of the 1971 Constitution, which identifies Islamic Shari’a law as the primary source of legislation. The FJP continues to advocate a strong role for religion in Egypt’s next political system, despite constitutional and legal provisions that ban religious-based political parties and the use of religious slogans, such as the Brotherhood’s Islam is the solution,” in campaigning. Meanwhile, the SCAF has continued to grant licenses to Islamist parties such as Building and Development, formed by the formerly militant group al-Gama’a al-Islamiyya, which appear to violate the existing legal framework. In addition to the FJP, other new Islamist forces are emerging as serious contenders on the political scene. The Salafi Movement is fielding candidates in the elections under the banner of the Islamic Alliance. The Salafi al-Nour (Light) Party, which dominates the Islamic Alliance, has significant financial assets enabling it to coordinate extensive voter outreach and campaign activities across the country. 610 of the Alliance’s 693 candidates are affiliated with al-Nour. Overall, the Islamist parties appear more organized and better funded than their secular and liberal counterparts, while maintaining a clear goal of establishing a Shari’a state. Meanwhile, “civil” parties have failed to form a strong coalition that offers a clear alternative, and still practice politics with the same defensive mentality that they were forced to adopt under Mubarak’s rule, when the opposition had no real chance of winning meaningful representation in parliament. Given the disorganization and timidity displayed by its civil rivals, it is no surprise that the FJP is confidently acting as though it has already won a parliamentary majority. An FJP victory is far from certain, however. Some think that the large number of Islamist candidates from a variety of parties and movements may contribute to splitting the Islamist vote, reducing their overall representation in parliament and giving an advantage to civil and liberal candidates, independents as well as the so-called remnants of the former ruling National Democratic Party (NDP), which have regrouped in at least eight different NDP-affiliated parties that are fiercely campaigning in the hopes of staging a political comeback, despite the government’s promise reactive a Nasser-era Treachery Law that would bar former NDP members from political activity for five-year period. In an attempt to confront hardline Salafis groups with a strong grassroots following, the civil parties are now beginning to coordinate with another Islamist force, the Sufis, whose 15 million followers adhere to a more moderate interpretation of Islam. Although the Sufi movement has traditionally been largely apolitical,Sufi groups have recently stepped into the formal political arena by licensing official parties, like the Sufi-dominated Egyptian Tahrir Party. Despite the weak coordination between “civil” parties and their lack of preparedness, most of these new parties, including the Adl (Justice) Party, the Egyptian Social Democratic Party and al-Masriyin al-Ahrar (Free EgyptiansParty), are working hard to catch up. One the oldest and most organized parties in the civil camp, the Wafd, will benefit from established support networks, although the party has recently suffered from internal disputes over its alliance with Brotherhood prior to its withdrawal from the Democratic Alliance. Although Islamists had an antagonistic relationship with the former regime, the FJP and other Islamist forces have shown support for the SCAF since Mubarak’s fall, Islamists forces are taking a very different and more cooperative approach to the current military leadership in an effort to carve out a strong role for themselves in the new political system. Early on in the transition, the Muslim Brotherhood showed support for the SCAF by backing the constitutional declaration in March 2011. But the alliance between Islamists and the SCAF began to deteriorate in July, after large-scale demonstrations by the FJP and other groups fueled fears of an Islamist takeover. As Islamists became increasingly assertive in the post-revolutionary political order, the SCAF made a clear shift, moving closer to liberal and civil political parties and drafting a set of supra-constitutional principles that Islamists fear would limit their influence over Egypt’s next constitution. In another sign of its alignment with liberal forces, the SCAF appointed two well-known liberals as deputy prime ministers, Hazem al-Beblawy and Ali al-Selmi, who was assigned to draft the new constitutional document. The draft constitutional principles signaled the SCAF’s commitment to preserving a civil state, but political forces soon realized that the document has another important objective: protecting the military’s political and economic privileges and shielding its budget from parliamentary oversight. While these four major coalitions will play an important role in upcoming elections, the polling process will likely give rise to new political forces and unforeseen alliances that could either work together or against one another in the next parliament. The inability of any one party to secure an absolute majority will encourage the formation of new coalitions or mergers between parties with similar orientations such as the more than fifteen new liberal parties that have formed since the revolution. The campaign season and electoral process will likely deepen the division between Islamists and "civil” powers, which has been expanding since the March referendum. Election results are impossible to predict, but Egypt’s next parliament will undoubtedly reflect a fundamentally altered political landscape marked by new voices, alliances and rivalries. Tens of thousands of protesters converged on Tahrir Square for an Islamist-dominated rally to demand an end to military rule and condemn the supra-constitutional principles proposed by Deputy Prime Minister Ali al-Selmi. The vast majority of protesters appeared to be Islamists, many of whom were transported to the square from other governorates in buses sponsored by the Brotherhood and Salafi groups. Meanwhile, state television reported that Prime Minister Essam Sharaf has decided to defer issuing constitutional principles until after parliamentary elections, and will conduct meetings with political groups to reach an agreement on the text of the document.